Ice fishing can be a surprisingly easy and cheap way to introduce yourself, family, or friends to fishing. The first and major warning I must give to anyone thinking about heading out on the ice is to make sure to contact your local authorities to see if the thickness of the ice is safe. There are many websites and forums that update the daily ice levels and the safety of the ice. 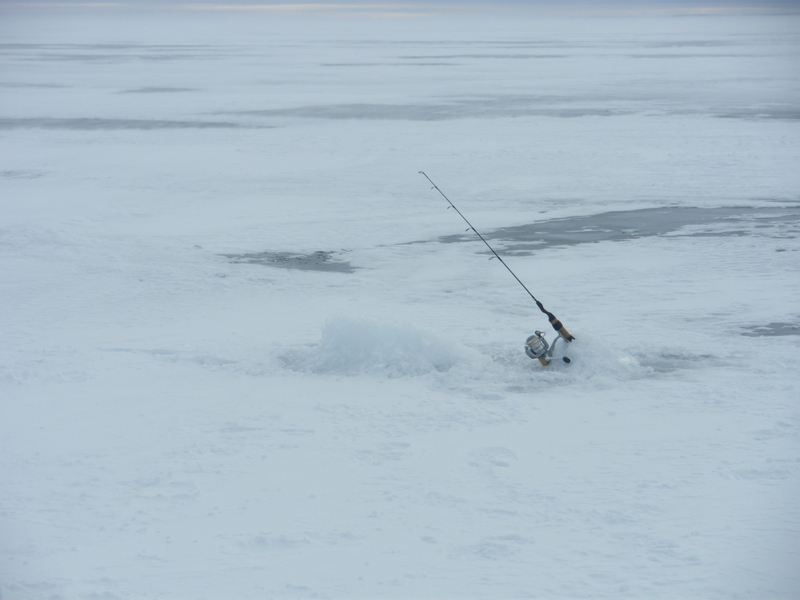 Your best bet is to wait until it has been cold for a very long time, usually in mid January or early February and this will of course depend on where you live, but some places open up for ice fishing as early as December. For ice fishing you basically need five major items. Number one is an ice fishing rod and reel combo like this one from Frabill. Ice fishing rods come in many different “actions” such as light, medium, or heavy. Depending on what you will be fishing for a medium action rod is a good place to start. It will allow you to fish for nearly all the fish species and will be the most diverse ice fishing rod you can get if you are just starting out. Secondly you will need some fishing line that is specifically designed for the cold weather. Ice fishing line usually comes in smaller pound test then regular lines since the fish don’t fight as hard as they do in the summer and they don’t have anything such as weeds or structure to bury themselves in. You can learn about fishing lines and their specifications in my article What Line Do I Need. This ice fishing line from Stren would be a great start. Stren Ice Line Pony Spool – 100 yards – 6 lb. Third you need an ice auger. This is as essential as a fishing rod because without it you can’t get at the fish. There are a variety of ice augers out there. Some make 6” holes while others make 8” holes and then there is the issue of a manual auger where you have to use your own strength to drill the hole or a gas power one. If you are just beginning a manual auger that makes a 6” hole is the best way to go. It doesn’t cost a fortune and you will quickly get the hang of it once you drill a few holes. You can usually get them on sale in the beginning of the year or check your local classified ads to get a great deal. Here is an example of one and me stuggling with one. 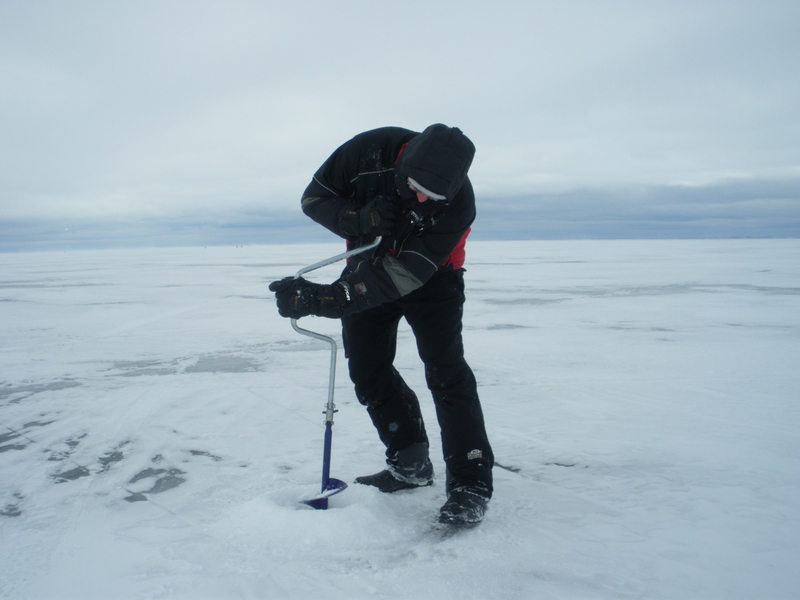 Piotr struggles with an ice auger. The fourth thing you will need is an ice skimmer. Basically this is a colander that you will use to scoop out any ice and snow that falls into the hole you drilled. This will be the cheapest item you will buy for ice fishing and the cheaper the better. These things don’t really break and my suggestion is to get a plastic one just in case it slips out of your hand it won’t end up at the bottom of the lake. Here’s what it looks like. The fifth and final things you will need are warm clothes and the will to get out there. Make sure you dress very very warm and take extra clothes. If you are cold you won’t enjoy yourself and you won’t land the big one. There are of course many other items you can buy, rent, or borrow for ice fishing, but what I just mentioned are the essentials. If you are looking just to get started then this is all you really need. Ice fishing huts, heaters, snowmobiles, sleds, and fish finders are items you can get once you get hooked on ice fishing (pardon the pun). A great way to head out for your first time is to go with a licensed ice fishing hut operator. They will usually provide you with all the tackle you need, a nice warm ice hut, bait, and travel to and from the hut. Just a word of warning however, going out with a hut operator, even for one day, can cost you almost the same amount as the equipment I just mentioned. So do some research, check out prices, hut operators, locations, and get out there on the hard water. I will cover more on ice fishing in following articles. Waiting for the bite on Lake Simcoe.